The Joint Strike Fighter Program from a design and engineering perspective. Why do we need another F-35 thread? First off this is not just an F-35 thread. Obviously with the X-35 winning the "Battle of the X planes" means we will have more information on the F-35 than any other JSF proposal, as its the "lone survivor" but this is also about the X-32, and other proposals that did not even make it that far. 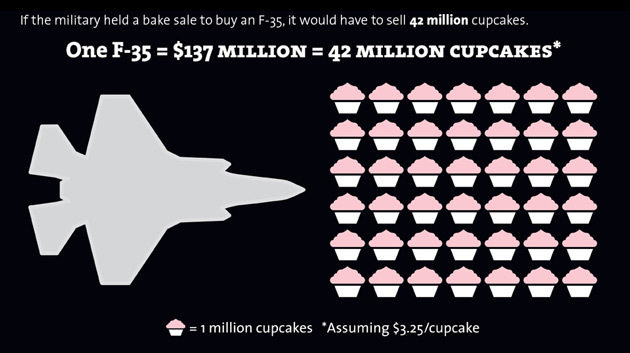 The F-35 cost in cupcakes... more baking than engineering. The Defense Advanced Research Projects Agency (DARPA) began a program in 1983 to begin looking at the technologies available to design and manufacture a follow-on supersonic replace for the AV-8 Harrier. The program, known as ASTOVL, would eventually lead become a joint U.S.-U.K. collaboration. In 1987 the results of the ASTOVL program made clear that the technologies available were not yet advanced enough to generate a replacement that the U.S. and U.K. would have been satisfied with. At this time, DARPA secretly approached the Lockheed Skunk Works in the hopes that they would be able to develop an aircraft like they had hoped would have appeared from the first phase of ASTOVL. Lockheed told DARPA that they had some ideas that could be matured and that, if they were successful would meet the goals that DARPA was trying to achieve. At the same time, DARPA continued with ASTOVL Phase II as a cover for the covert work being done at the Skunk Works. In the late 1980s the Lockheed Skunk Works was involved in a classified, non-acknowledged program with NASA Ames that looked into the feasibility of designing a stealthy supersonic STOVL fighter. This was a cooperative program that utilized the assets of NASA (wind tunnels, personnel, super-computers, etc.) along with the expertise of the Lockheed Skunk Works in designing stealthy air vehicles. The results from this highly classified program proved that a SSF could be successfully flown. Management at the Lockheed Skunk Works was convinced that the SSF design could be sold to both the U.S. Air Force and the U.S. Navy. (The U.S. Navy (NAVAIR) is the procuring office for Marine Corps aircraft.) The Skunk Works proposed a teaming between the USAF and the USN. The services agreed, a Memorandum of Understanding (MOU) was signed between the services and the SSF program began to come out of the black. The ASTOVL/SSF concepts were originally seen as developing a replacement for the U.S. and U.K. Harrier jump-jet. As the ASTOVL/SSF concepts became multi-service with the suggestion of multiple variants, the program was re-christened as the Common Affordable Lightweight Fighter (CALF). The management of the CALF program was handed by DARPA due to the experimental nature of the concept. DARPA was also managing the ASTOVL program, which was used by the SSF program as their unclassified, white-world cover story. The CALF program's aim was to develop the technologies and concepts to support the ASTOVL aircraft for the USMC and Royal Navy (RN) and a highly-common conventional flight variant for the U.S. Air Force. Although the CALF program was organized upon a suggestion from Lockheed, the government still wanted multiple contractors involved in the program. Initially, the only two contractors involved were Lockheed and McDonnell Douglas. Boeing later approached DARPA and offered to meet DARPA's financial contribution if they were allowed onto the program. The CALF program has also been called the Joint Attack Fighter (JAF). The U.S. Air Force’s MRF program began in 1991 as a relatively low-cost F-16 replacement. Similar in size to the F-16, the MRF was to have been a single-seat / single-engine aircraft, with a unit flyaway cost in the range of $35 to $50 million. The MRF Program was managed by the Aeronautical Systems Center (ASC) at Wright-Patterson Air Force Base, Ohio. ASC hosted a planning meeting with industry in October 1991, and issued a Request For Information (RFI) with responses due in January 1992. The major U.S. aircraft manufacturers began to conduct concept and design studies for the MRF at their own expense. A formal program start was expected around 1994. The MRF was expected to replace a large number of F-16s reaching the end of service life. The MRF might also have replaced Air Force A-10s and Navy F/A-18C/Ds. Therefore, providing large numbers of aircraft affordably was a higher priority for the MRF Program than any specific capability enhancements. However, the post-Cold War defense drawdown made the F-16 service life situation considerably less critical. A reduction in the total number of U.S. Air Force fighter wings meant that the existing aircraft would not be replaced one-for-one. Furthermore, F-16 aircraft flying hours were reduced, allowing F-16s to remain in service longer than originally projected. In August 1992, the MRF program was effectively put on hold. Due to budget pressures and the Air Force’s commitment to the F/A-22 program, sufficient funding for a new program start did not appear likely until around 2000. Until then, it was expected that MRF activity would proceed at a low level. Meanwhile, the Air Force intended to continue production of Block 50 F-16s. By early 1993, however, the MRF’s projected IOC had slipped to 2015. Shortly thereafter, the BUR canceled the MRF Program. The U.S. Navy Advanced Tactical Aircraft (ATA) program began in 1983 as a proposed long range, very low observable, high payload medium-attack aircraft to replace the Grumman A-6 in the carrier-based, medium-attack role. On January 13, 1988 the McDonnell Douglas and General Dynamics team was selected over a Northrop team to develop the ATA. Designated the A-12 Avenger II, the unique flying wing design was to be a long-range, subsonic aircraft with a large internal weapons load including air-to-surface and air-to-air weapons. Following the disclosure of severe cost and schedule overruns and technical problems in late 1990, the A-12 program was canceled on 7 January 1991. Due to Congressional intervention, the U.S. Navy agreed to evaluate a navalized version of the U.S. Air Force's Advanced Tactical Fighter (now the F/A-22) as a possible replacement for their F-14s. In return, the U.S. Air Force would evaluate a derivative of the ATA as a replacement for their F-111s. In late 1988, a Naval ATF (NATF) program office was set up at Wright-Patterson Air Force Base and the existing ATF Dem/Val contracts were modified to include studies of potential NATF variants. The Major Aircraft Review reduced the peak production rates of both the ATF and NATF. This had the effect of substantially increasing the program cost. In August 1990, Admiral Richard Dunleavy, who was in charge of Navy aircraft requirements, stated that he did not see how the NATF could fit into any affordable plan for naval aviation. In early 1991, before the final contractor for the ATF was even selected, the consideration of the NATF was dropped. This was mainly due to the fact that the Navy realized that a series of upgrades to their existing F-14's could meet the Navy's air superiority needs through 2015. In January 1991, with the cancellation of the ATA and the NATF, the Secretary of the Navy directed that planning commence for a new A-6 replacement program. This new program became the known as the A-X, an advanced, “high-end,” carrier-based multi-mission aircraft with day/night/all-weather capability, low observables, long range, two engines, two-crew, and advanced, integrated avionics and countermeasures. The Air Force participated in this new program from its initiation, still seeking a replacement for the F-111 and, in the longer term, the F-15E and F-117A. The original A-X / A/F-X CE/D work was due to be completed in September 1992. A solicitation for Demonstration/Validation (Dem/Val) proposals was expected in late 1992, leading to a Dem/Val start in 1994 and EMD in 1996. Under the Navy’s original plan, the short Dem/Val phase would consist of design refinements and other risk reduction activities, but would not include flying prototypes. However, in late 1992 Congress directed that the A-X Dem/Val phase also include competitive prototyping. This increased the projected duration of the Dem/Val phase from two to five years. Concurrently, as a result of the termination of the NATF in 1991, increased air-to-air requirements were added to the A-X, prompting a change in the name of the Program from Advanced Attack (A-X) to Advanced Attack/Fighter (A/F-X). The existing A-X CE/D contracts were extended to reflect a revised Dem/Val strategy to accommodate flying prototypes. The expected IOC date of the A/F-X slipped from 2006 to 2008. A Defense Acquisition Board (DAB) Milestone I Review of the A/F-X Program was expected in Spring 1993; however, the BUR placed the A/F-X program on hold pending the outcome of the report. An Milestone I DAB for the A/F-X never took place. On 1 September 1993, the release of the BUR announced the cancellation of the A/F-X as well as the MRF. As a result of the BUR, A/F-X efforts during the latter half of 1993 were directed toward closing out the program and transitioning applicable experience and results to the upcoming JAST program. A core of A/F-X personnel performed a large portion of the working-level planning and definition of the emerging JAST Program. The A/F-X CE/D contracts were extended a second time, through 17 December 1993, to allow the contractors sufficient time to bring their activities to a logical conclusion. All A/F-X program operations ended on 31 December 1993. This is an hour and a half, but does a wonderful job explaining the JSF origins and the Battle of the X-planes. I would consider it a must listen (and luckily it works well in the background at the work bench) has tons of explanation and inside info and funny/interesting anecdotes from a Skunk Works Engineer and designer of the the Shaft Driven Lift Fan featured on the X-35/F-35, Paul Bevilaqua. Three aerospace giants are competing to build the Joint Strike Fighter, a next-generation warplane that not only could be used by the Air Force but could fly from aircraft carriers for the Navy and land and take off vertically for the Marines and the British Royal Navy. Lockheed Martin Corp. of Bethesda, McDonnell Douglas Corp. of St. Louis and Boeing Co. of Seattle have all fielded entries in the competition, and sometime in the middle of next month the government will tell two of them to build prototypes. The final winner should be selected in 2000. Each company took a different approach. Lockheed Martin created its Joint Strike Fighter by borrowing from its design for the F-22, which is a stealthy air superiority fighter that will replace the F-15. Though experts have labeled the resulting Joint Strike Fighter proposal as "middle of the road," Lockheed Martin defends it as a conservative entry in a program that mandated low risk and conservatism. David Wheaton, corporate vice president and Joint Strike Fighter program manager, said the design team did not set out to stick with what worked on the F-22. It went through hundreds of possibilities, he said, before finally agreeing that an F-22-type approach worked best. "We could have made a much more exotic-looking airplane," he said, "but it wouldn't have been nearly as balanced." Its performance, the company claims, matches or exceeds that of Lockheed Martin's biggest project -- the F-16. Its sloping sides, canted vertical tails, sawtoothed bay doors and serpentine inlet duct contribute to the plane's stealthiness. For the vertical takeoff and landing component, Lockheed Martin is proposing a big lift fan in the center of the plane that would be driven by a shaft and clutch from the main engine. The fan puts out cool air, which solves the common vertical takeoff problem of hot exhaust being drawn back into the engine and causing it to overheat. On Air Force versions of the plane, the fan would be replaced by a fuel tank. Lockheed Martin has tested the lift fan extensively, and built a scale prototype of the plane that has undergone thousands of hours of wind tunnel work. McDonnell Douglas is leading an all-star team with Northrop Grumman and British Aerospace, but the three were slow to settle on a design for their Joint Strike Fighter. After quibbling over propulsion for a while, they settled on a configuration in the middle of last year -- long after the other two teams had begun testing their designs. And it is not a risk-free proposal. McDonnell Douglas has taken two gutsy steps: First, it proposes a design that does not have a vertical tail. That makes the plane much more stealthy, but less stable than a traditional plane. The pilot would use vectored thrust to make up for the lack of a tail. Second, McDonnell Douglas' team proposes using a separate engine for vertical lift. Designers point out that if the main engine somehow failed or were shot out, a pilot could theoretically limp home on the secondary engine. But for a vertical landing, that secondary engine would have to start up reliably after sitting idle and cold during the plane's flight. The Marines rejected such a configuration during an earlier research project. The McDonnell Douglas entry is probably the stealthiest of the three, most analysts agree. And, according to trade writer Bill Sweetman, the more controversial aspects of the plane are "not inherently any more risky" than the other teams' planes. It's more a matter of selling the military on a different way of doing things. Boeing took an aggressive approach to what otherwise could have been a stately competition between a pair of stalwarts, Lockheed Martin and McDonnell Douglas. Drawing on its vast experience building commercial planes, Boeing fielded a design that looks radically different. 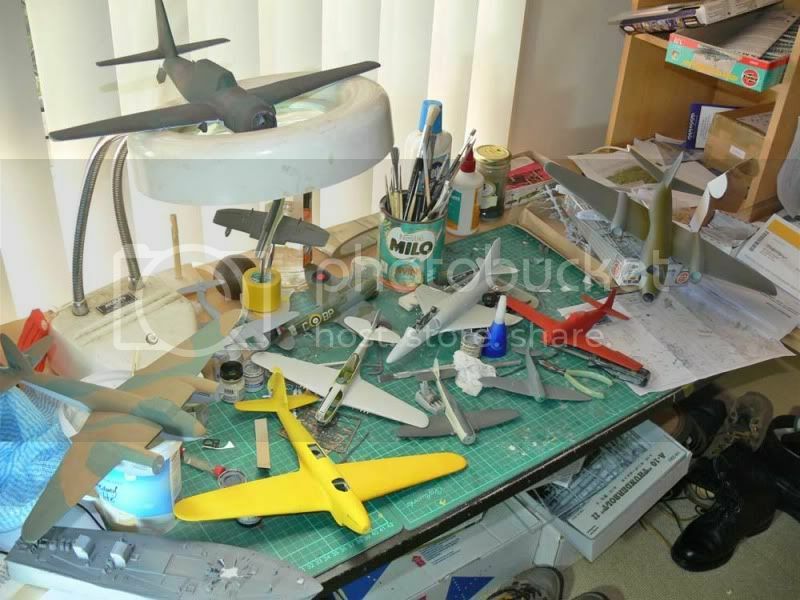 The plane has four basic components, the most noticeable being a big, single-piece delta wing. 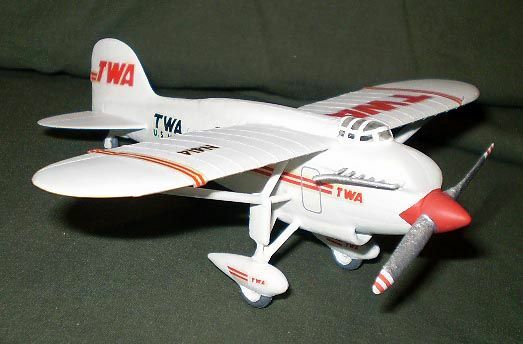 The dual canted tail, the cockpit and the fuselage underneath complete what is by far the simplest overall configuration in the contest. Boeing claims almost 90 percent commonality for its design, meaning that only 10 percent of the plane must be modified to satisfy the various military services. For vertical takeoff and landing, Boeing again took a simpler approach, eschewing any kind of secondary engine or fan and relying on the main propulsion system. Ducts and nozzles direct main engine thrust under the plane to lift it. There has been some difficulty getting enough thrust out of the engine to lift the plane this way, but company officials say they can lick the problem. It is the smallest and lightest of the three planes -- so small that it would not have to fold its wing to fit in the cramped space of a British aircraft carrier. The other two planes would. Like Lockheed Martin, Boeing has subjected its design to extensive testing. You can also see a lot of interesting photos if you do a google Image search on "F-35 production"
With hindsight, do you think it was a mistake to merge the F-16 replacement, A-6 replacement and Harrier replacement into the same program? Would it have been easier to build two or three different aircraft for the four different customers (USAF, USN, US Marines and RN), or would the reduced orders and market for the STOVL version have made it too vulnerable to cancellation? The Ryan XV-5 used gas-driven lift-fans, and the Avrocar lift/flight fan was also gas-driven. And neither was particularly successful. I wish McDD had gone to shaft-driven fan when gas-driven didn't pan out; their aerodynamics are/were better than Boeing's (I know the aero folk at Fort Worth considered them the far more dangerous competitors); too, separate lift+lift/cruise engines violated the terms of the competition and cost them a chance. Well technically the F/A-18F has panned out as the A-6 replacement and in Australia the F-111 replacement while the F-35C will replace the USNs and some Marine Classic Hornets while the B will replace the remaining USMC Classics as well as their AV-8B and B+ fleets. Why didn't gas-driven pan out? On the face of it, I find the idea of diverting lightweight gas through fixed pipes much more attractive than driving 40,000hp through a clutch, a shaft and a 90 deg gearbox. Okay, but what replaces what is not quite what I'm getting at. Let me put it another way: The F-35A is land-based CTOL, the F-35B is STOVL and the F-35C is carrier-based CTOL, but they're all based on the same airframe. To what extent is each type compromised in it's role by the need to build the other types from the same basic airframe, and to what extent are the capabilities of the whole programme compromised by the need to repalce so many different types? In other words, would the F-35 be a better F-16/F-18 replacement if it wasn't also trying to be an AV-8B replacement and an A-10 replacement all in the same basic airframe, and vice-versa? Primarily the inefficiencies of the system, especially when scaled up from test rigs (same thing happened with the augmented wing on the XFV-12A). Between duct losses and inefficiencies of the drive turbines, you lose way too much energy. But, for hovering, the F-35B can rely on 40,000 pounds of thrust without having to use reheat. The F135's full-authority digital engine control (FADEC) software runs the engine at a higher temperature for hover flight than it does during conventional flight, producing more "dry" thrust than the engine normally develops without activating its afterburner. "We de-rate for CTOL (conventional take-off and landing)" operations, explained Dan Tennant, Pratt & Whitney's F135 system demonstration and development program manager. When the F-35B is hovering, all 40,000 pounds of thrust is directed downwards, not backwards. It also can be directed anywhere in between, and even slightly forwards, said Tennant. McAir basically gambled that the STOVL design wouldn't be weighed as heavily as it was, even though I think they were warned the government would not accept it. Let me put it another way: The F-35A is land-based CTOL, the F-35B is STOVL and the F-35C is carrier-based CTOL, but they're all based on the same airframe. To what extent is each type compromised in it's role by the need to build the other types from the same basic airframe, and to what extent are the capabilities of the whole programme compromised by the need to repalce so many different types? I think this thread is going to explore that. The JSF and compromised seem to go hand and hand but is there anything to it? and can we look at other programs as examples? First stand by for a "Stream of consciousnesses" post that hopefully doesn't get too muddled. I am looking at this first from an engineering perspective, I will save the political decisions and needs for another time. An extreme example: is the F-22 compromised by its inability to carry paratroops? We would probably say no since that was not one of its goals, and early on we knew that this would not be a cargo aircraft, so the inability to carry cargo does not compromise its mission. So how "compromised" something is IMHO has a lot to do with the goals/requirements of the weapon systems. TFX struggle because the mission sets simply differed too much. The Sluf armament system used a very primitive computer and the inertial platform data and basic ballistics data for bombs to provide extremely accurate bombs. Oh yeah, a real HUD from Marconi. The Hog would only have had to used a simple range radar to enable a computer to provide the bomb impact dot on the HUD, but not requiring a cosmic radar like the Sluf had ( we had terrain following and terrain avoidance and two ground map modes and a beacon mode and bomb delivery mode that provided the computer with slant range). - We A-37 and A-7D folks understood the new plane would basically be a jet-powered A-1, and would supplement the A-7D. We knew the A-37 would never see combat again after 'nam except for a COIN scenario. The emphasis was upon CAS and CSAR and such, with a bit of BAI thrown in. Thinking and actual force build up at the time was the A-7D replacing the F-100 and supplementing the F-4 for interdiction. And the SLUF was very good at CAS. The only two planes with in-country FAC ratings of 15 meter CEP were the SLUF and Dragonfly. We have the 7th AF Corona Harvest documents to back up my assertion. - Somewhere along the way the Cheyenne popped up and USAF was afraid of losing the CAS mission. Then there was the Fulda Gap. And if I was writing a book, I would call it "How a valley in Europe designed a (not so) modern warplane". - We attack folks wanted both the A-X and the A-7D. The LWF program was just gaining traction, but we all thot it would mainly complement the Eagle and have a limited A2G capability to supplement the F-4, A-7 and A-X. F-100 wings would be replaced by A-X or A-7D. Maybe an F-4 wing would go, and all the Thud outfits were moving to Guard and Reserve. Congress wanted as cheap an airplane as they could get, and USAF sold the A-X as not needing computers or high-tech stuff to do the job. My editorial back in 1974 made this clear and I was harshly reprimanded for saying so. Interestingly, my CO and wing DO saw the letter before I mailed it and had no qualms. As a result, we had a significant period of reduced A2G capability in the late 70's and early 80's until the Viper came onboard in numbers, and we should all thank God the plane was such a great design. ...So we see what we needed for the Vietnam scenario and realize that the Hun, Thud and Double Ugly ain't gonna hack it for CAS and BAI. Talking about 1969 or 1970. The A-1 and the A-37 did super work in that environment from mid 60's to early 70's. To get the A-10 we had to "dis" the A-7 and admit the Hun and 'vaark and Thud were not well-suited for CAS. We also had to move from piston motors to jets, so the A-1 was off the table. The A-37 was off the table because it was a superb COIN plane but could not meet the new requirements that included tank-busting and large payload. The A-7D was so gold-plated that the Viper did not come close until the late 80's. It ( the Viper) had great A2A capability and a decent ground map radar and such. Sweet. Is the A-10 compromised? Is its world famous gun a part of what compromised it from being more versatile, or faster? etc? would it have been better served with a radar like the A-7? Are all CVN aircraft inherently compromised by heavy structure needed to land on ship with cats and traps? A Super Hornet weighs as much as an F-15 for example. You can look at Rafale, which replaces no less than 6 aircraft types with the French Air Force. including two carrier types, thus requiring Carrier capability in the original design from the outset. Is the Rafale thus compromised? But its part of a larger trend of multi-role aircraft taking over not just one type, but many. The original manufacturing plan saved money, but not weight. 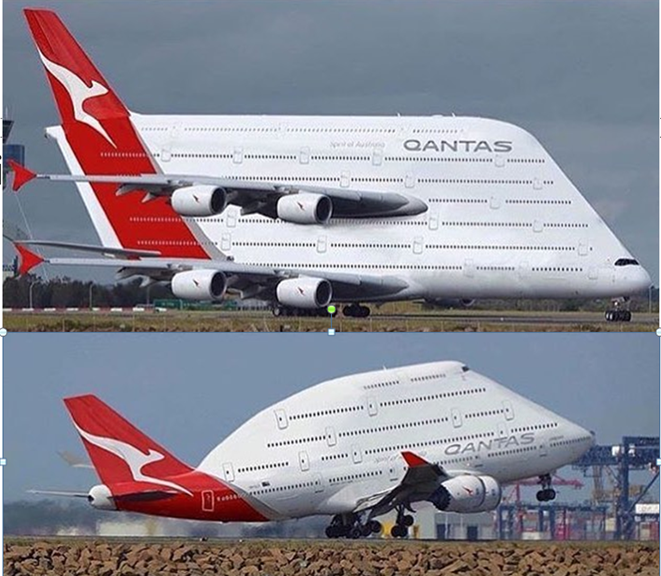 I think the aircraft being a LO shape had more impact than STOVL in terms of aerodynamics. That just my opinion. The goal with ASTOVL and the USMC, was making a hovering F-18. when they were merged into CALF with the USAF the USMC basically deferred to the USAF so long as it hovered, and the USMC and USAF goals were very aligned. Both the USMC and USAF were fine for example with a 1,000 lb bomb load. the USAF was looking for a multi role F-16 replacement, the USMC multi role F-18 replacement with the ability to do STOVL. both favored single engine, both favored lighter as opposed to more advanced hi-end design etc. BF-1 just did its 1,000th VL, so I would say the propulsion system is damned good, and presuming the propulsion system is good I think its actually trickier in this case to meet the USN goals, the F-35C is the most "different" of all the variants I believe. The next post can be about the politics, but to keep it simple, I would say that there was absolutely no way the USMC/RN could have ever been able to independently procure an advanced STOVL airplane by themselves, and even under the large JSF umbrella it was the version that most people suggested ending, most often including the RN being forced by politicos to briefly go to the C, before going back to the B. So I don't think it could have ever happened if it wasn't merged with other aircraft, but having said that the STOVL version of JSF benefits massively from the other variants in terms of advanced capability. There is simply no way the USMC or RN were ever going to get a jet (especially STOVL) that advanced all by themselves. Whats funny is there seems to be a much bigger market for the STOVL variant (turkey just announced its buying F-35Bs) than there ever was the F-35C. Re the question of "compromise" let me just say that any design (even when people make outlandish claims such as "not a pound for Air-to-ground") is a result of compromises. Anyone who says otherwise is lying! Page created in 0.375 seconds with 20 queries.